We all know that dogs love Jeeps. 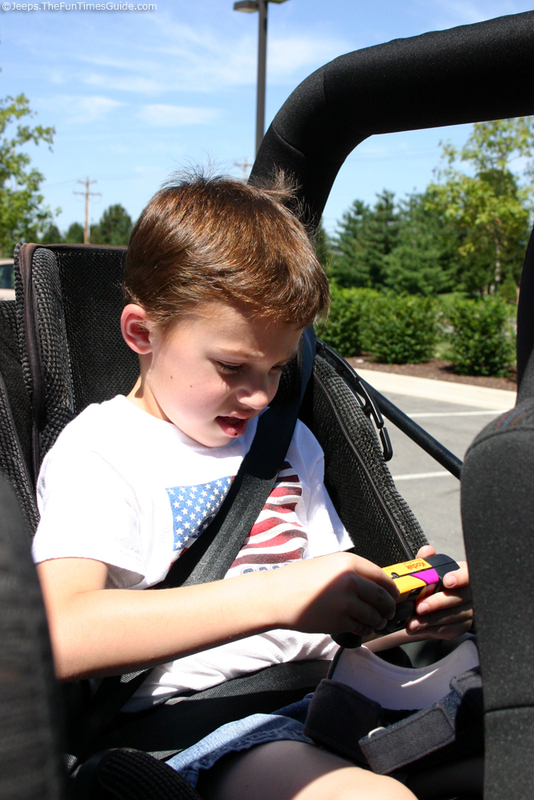 But there’s no denying that kids love Jeeps, too — probably even more! 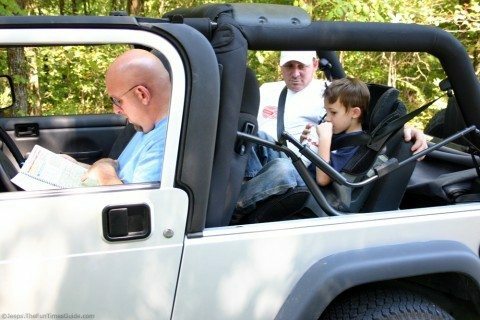 I know the times we’ve taken our nephew Jeepin’ he’s had the time of his life, especially when we had the soft top off the Jeep Wrangler. More pictures of kids that love Jeeps. 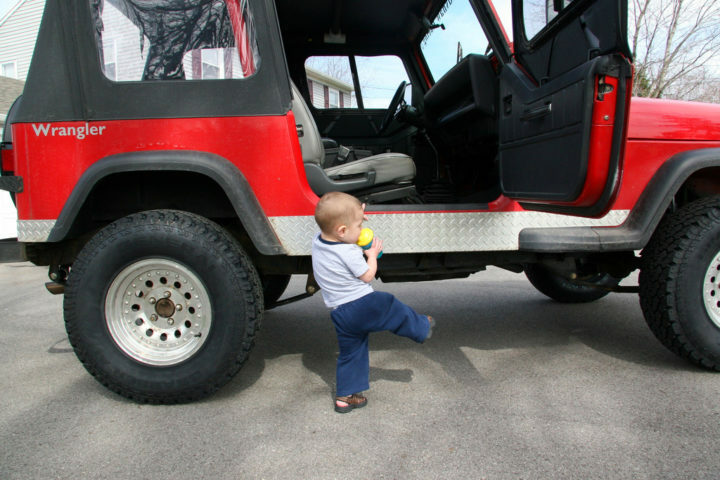 In case you’re thinking of buying a Jeep (or taking your little one for a ride in a rented Jeep someday soon), I found some interesting things about kids and Jeeps that you might enjoy…. For starters, if you’re wondering just how popular Jeeps are with kids of all ages, have a look at all of the Jeep merchandise designed and sold just for children! Jeep wall borders for kids’ rooms available at department stores and online. The ever-popular 12-volt Ride-On Jeep Toys (usually just referred to as Jeep Power Wheels) are self-propelled ride-on toys for kids ages 3 and up. Quadratec, one of the leading vehicle parts suppliers sells Jeep strollers, playpens and puzzles. And finally, when you do a quick search for “jeep kids” on Amazon, you get over 4,000 Jeep products just for kids! If you’re wondering about the placement of car seats & booster seats inside a Jeep, there are only 2 seatbelts in the back of a 2-door Jeep Wrangler Unlimited, but there are 3 seat belts in the back of the 4-door Jeep Wrangler Unlimited. The Jeep Wrangler Unlimited Rubicon, however, goes a step further than other 2-door model Jeep Unlimited’s by having the 3-point seat belts for rear-seat passengers as a standard option. View seat belt laws by state. 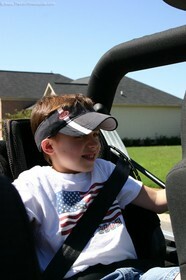 Check out the car seat data for the Jeep Wrangler Unlimited. If you really want to bring the spark back to a bored child’s eye, ask them if they want to go on a Jeep ride instead of a car ride! It doesn’t really matter where you go, nor how far you go… we’ve found that the simple act of being in the Jeep with the top down is priceless to a child. 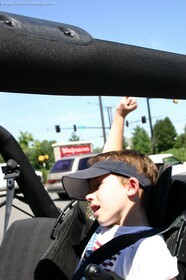 You can take a kid around the block in a Jeep Wrangler and he’ll rave about it for days — especially if the soft top is off! So, why not explore the great outdoors with your child safely buckled in on the next beautiful sunny day? 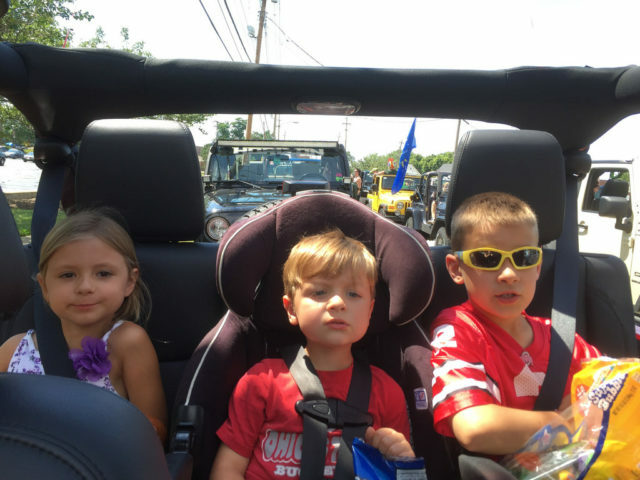 And, for the ultimate in Jeep rides with kids… take the soft top off the Jeep Wrangler, apply sunscreen to all aboard, give your little one a disposable camera, and get ready for some wild and crazy Jeep fun — all in the eyes of a child! We’ve done this with our nephew Dylan. And we all had a blast. 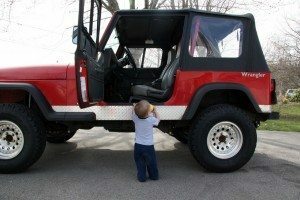 Little kids aren’t the only ones to love Jeeps…. Lots of first-time drivers wish their very first vehicle could be a Jeep. And Jeep Wranglers are extremely popular among the 20-something crowd. Rest assured, the automakers are fully in tune with what young drivers want and they go to great lengths to market to a younger generation of drivers. For example, check out the Top 10 Jeep Commercials. And it’s no shocker that kids and their parents don’ t always agree on the best vehicle choice. Here’s more about kids vs parents’ preferences when it comes to the best vehicle for teens. Teens rank a Jeep Wrangler as #2 on the list of top 10 vehicles they want to drive, while parents rank the Jeep Wrangler #10 on the list of top 10 vehicles they want their children to drive. Here are our best tips before you buy a Jeep Wrangler, including the pro’s and con’s of Jeep Wrangler Unlimiteds.